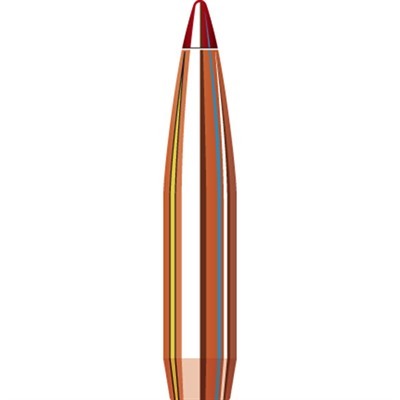 Hornady engineers discovered that commonly used bullet tip materials in streamlined, high BC bullets melt and deform. Although not a significant issue affecting moderate BC conventional tipped varmint and hunting bullets, aerodynamic heating causes BC reduction and degradation of accuracy, particularly at extended ranges (400 yds +). To counter this effect, Hornady identified a heat resistant polymer and developed the Heat Shield tip. This revolutionary new tip creates the perfect meplat (tip) with exceptionally consistent results from bullet-to-bullet and lot-to-lot.